This is a three part architectural fine art series that I created recently while one location in Charleston, South Carolina. Though today I'm a working professional in the world commercial photography, I've been an artist my entire life. I've enjoyed creating art with many mediums over the years including but not limited to drawing, painting, sculpture, photography and music. This short series is an homage to those years of studying the elements and principles of design such as line, form, shape, repetition, space color, texture, and rhythm. Truth be told, this series didn't happen intentionally. I didn't seek out the creation of these images, in fact they found me. I was traveling in South Carolina and had an opportunity to hop on a boat and spend a good portion of the day on the Atlantic ocean. While on the boat, I saw many things that caught my eye, including some nearby dolphins. But I've always been fascinated with bridges for some reason. They also bear many philosophical meanings. 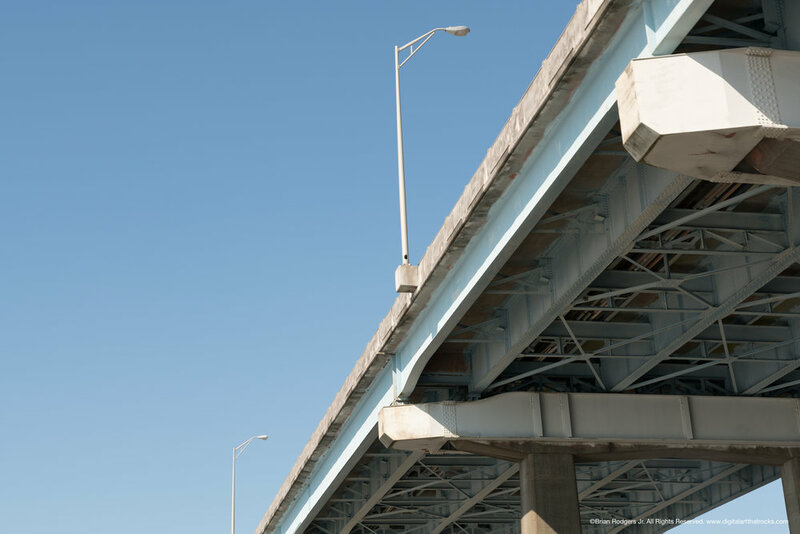 I photographed these bridges traveling at least 40 mph. With my camera in hand, I quickly composed and framed this series of bridge photographs capturing what naturally came to my mind's eye. I’m always intrigued by finding the simplicity in something so seemingly complex. 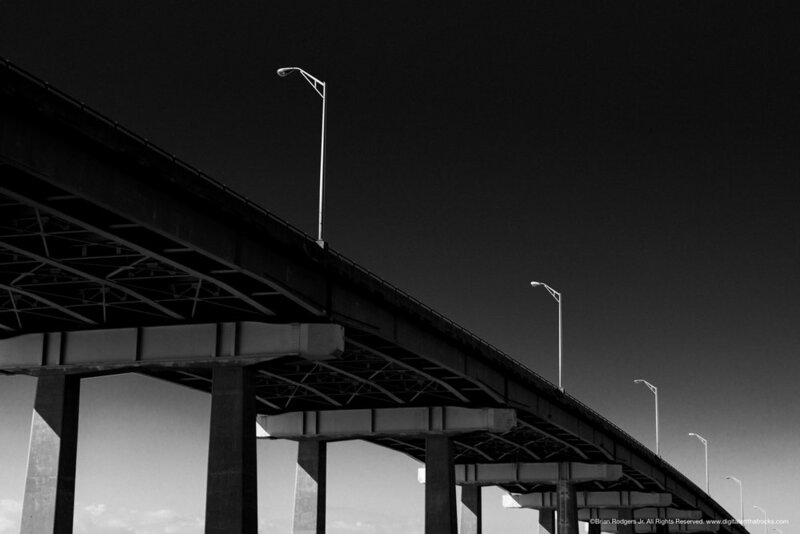 This fine art bridge series isn't about technical approach. It's not about documenting the environment in which the bridge exists. It's about creating a mood, and a feeling. I think these images offer the viewer a haunting beauty. These images are desolate in the fact that there are no clouds floating around in the sky... as if everything is at a stand still. There are no moving cars. No people. Just metal structures in the sky with a lot of negative space, repetitive lines, shape and form. But deeper than that, a sense of mystery and alternate thinking. I think it's important that we don't always take things at face value. Many things in life have much deeper meanings. Look at the before and after of this architectural image. It may look like a pretty mundane image at first glance, however when meticulously processed in black and white the image takes on a completely different mood. Be sure to check out my architectural photography portfolio HERE. Some of my local markets include South Bend, Fort Wayne, Indianapolis, Chicago, Grand Rapids, and Lansing to name a few. Architectural Imagery from Digital Art That Rocks can help you advertise your space to fill it with customers, sell a client on your architectural/construction services or even help your marketing team furnish a hotel with large fine art prints. If my work resonates with you, please let me know how I can be of service. 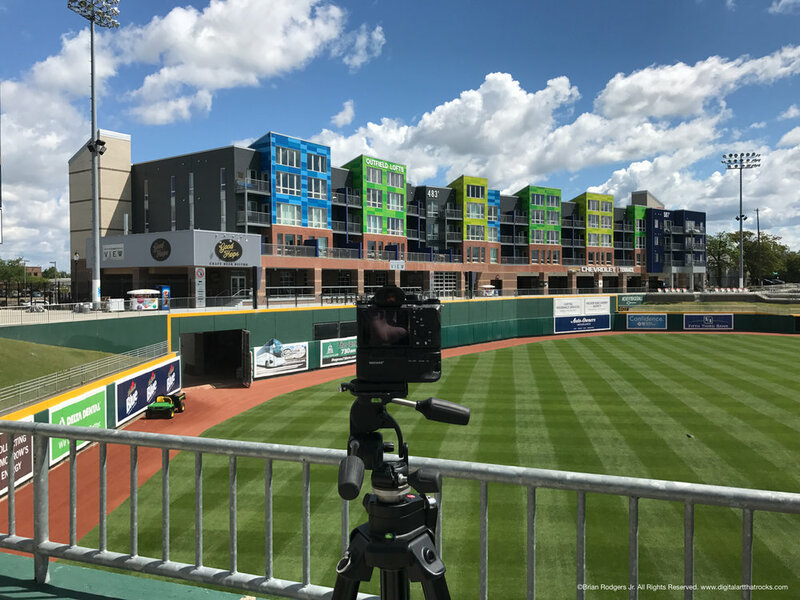 I recently had the opportunity to photograph some architecture on location at Cooley Law School Stadium in Lansing, Michigan for my friends at Jones Petrie Rafinski! This baseball stadium is home of the Lansing Lugnuts. Photographing the architecture at this location was a really fun project that presented some unique challenges. 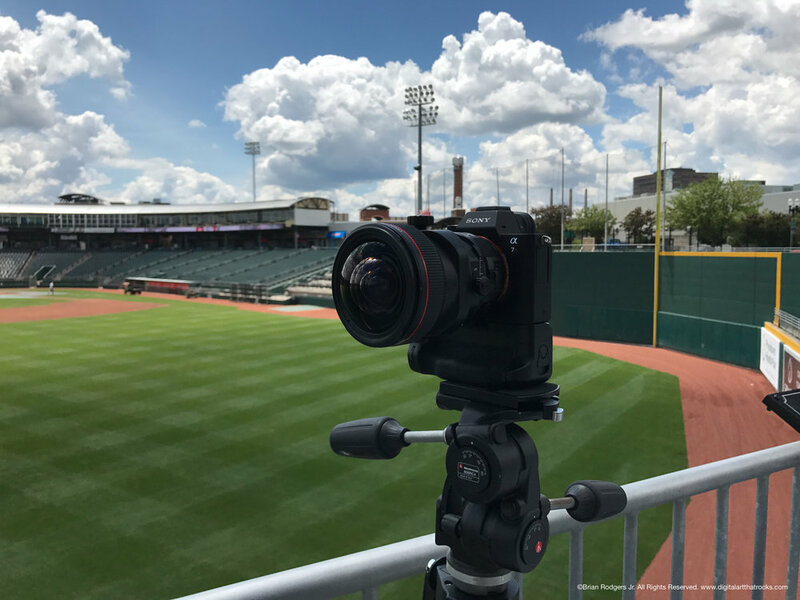 The biggest challenge being that the architecture was to be photographed during a live baseball game to show the architecture and surrounding environment in use. As you can imagine, it can be hard to predict exactly how many people may or may not fill the stadium on any given evening. In addition to that, when photographing architectural exteriors, you are often times at the mercy of the weather. Luckily, it was a gorgeous day with plenty of interesting clouds providing really nice dappled pockets of light to work with. This warm and inviting environmental exterior image features a hoppin' stadium-side view of Good Hops Craft Beer Bistro alongside the Outfield Lofts. The modern interior features contemporary brushed metal and brick aesthetics, perfect for any craft brew bistro accompanied by an amazing view of the stadium. Check out my architectural photography portfolio HERE & be sure to head over to the Jone Petrie Rafinski website for planning, surveying & other architectural services. Some of my local markets include South Bend, Fort Wayne, Indianapolis, Chicago, Grand Rapids, and Lansing to name a few. If you're an architecture firm or business looking for an architectural photographer, please let me know how I can help.